The deadline for nominations for this year’s Dacorum Sports Awards has been extended to allow more entries to be given a chance to shine. Sportspace, Dacorum Sports Trust – in partnership with the Gazette – are looking to celebrate the borough’s sporting stars, and the search is on for talented sporting individuals, teams and clubs in our area. As well as recognising those that actively participate in local sport, the Dacorum Sports Awards are also an excellent opportunity to reward those who work tirelessly behind the scenes in a coaching, administrative or official role. Amanda Colwill, head of sport at Dacorum Sports Trust, said: “The Sports Awards is one of the highlights of the year and an event that we all look forward to. Any award ceremony is only as good as the quality of nominations received so we are calling on all local clubs, teams and individuals to support the event and send in their selections. The judging panel will be made up of local sports representatives from clubs, The Dacorum Sports Network, the Herts Sports Partnership and other key partners. 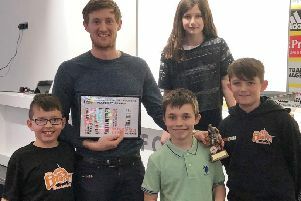 The award ceremony will take place in May at Little Hay Golf Complex, and nominations can be made online via the Sportspace website www.sportspace.co.uk or nomination forms are available at Sportspace receptions. Nominations can be submitted in the following categories: Sports Person of the Year; The Rising Star Award; Club of the Year; Contribution to Disability Sport; Team of the Year; Community Coach of the Year; Junior Community Coach of the Year; Volunteer of the Year; The Dacorum Sports Network Lifetime Sporting Achievement Award. Nominations should focus on performances and achievements between January 1 2015 and December 31 2015. Nominees will be judged on the quality of the nominations and information provided and not on the quantity of nominations received. Nominees and shortlisted candidates will be contacted prior to the awards on Friday, May 20 2016. For further information, please call the sports development team on 01442 507155.